[–1]: Put a +1/+1 counter on each creature you control. Those creatures gain vigilance until end of turn. [–6]: Create a white Avatar creature token. It has "This creature's power and toughness are each equal to your life total." [+1]: Target permanent doesn't untap during its controller's next untap step. 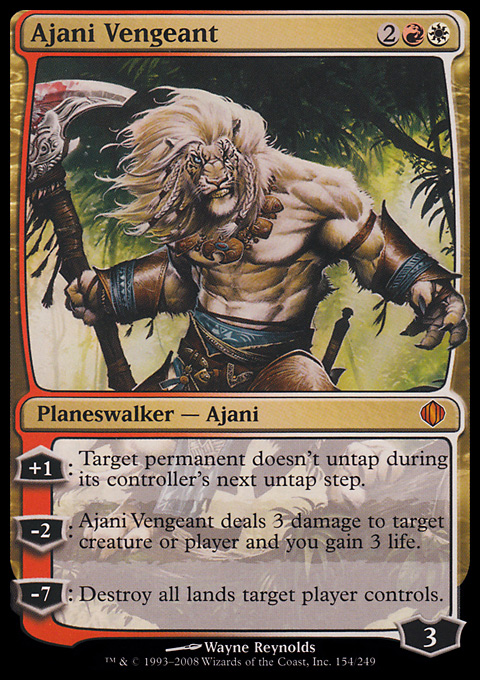 [–2]: Ajani Vengeant deals 3 damage to any target and you gain 3 life. [–7]: Destroy all lands target player controls. 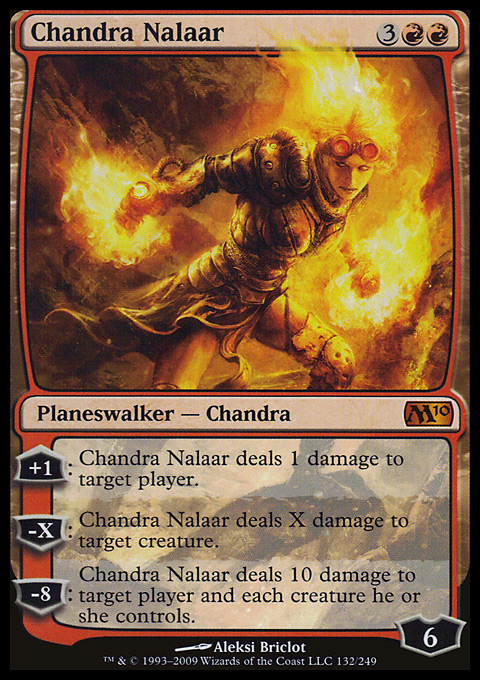 [+1]: Chandra Nalaar deals 1 damage to target player or planeswalker. [–X]: Chandra Nalaar deals X damage to target creature. 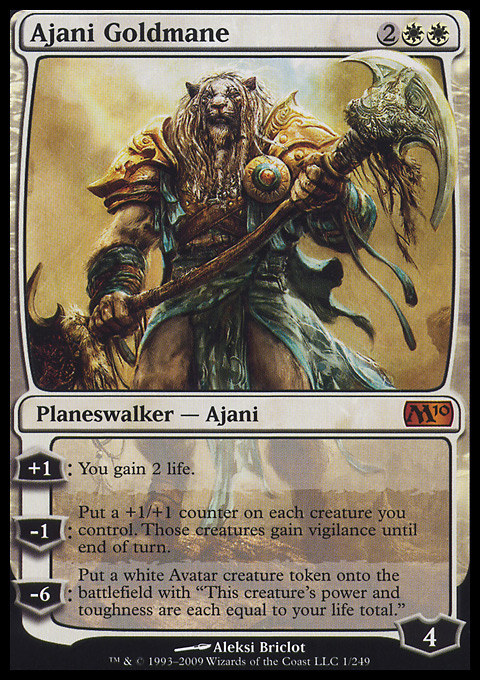 [–8]: Chandra Nalaar deals 10 damage to target player or planeswalker and each creature that player or that planeswalker's controller controls. 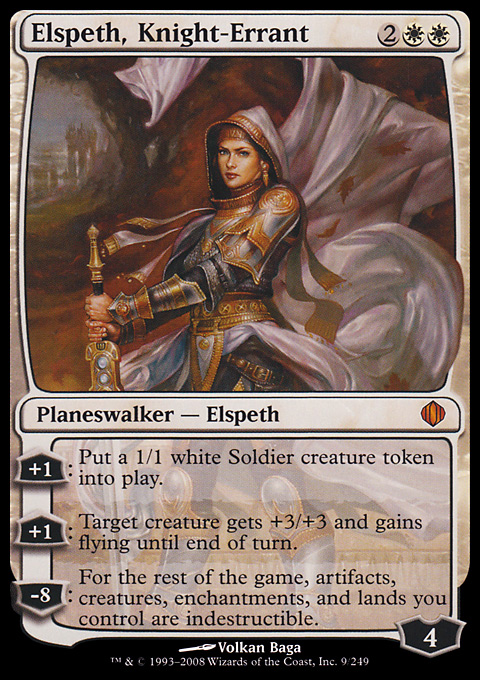 [+1]: Create a 1/1 white Soldier creature token. [+1]: Target creature gets +3/+3 and gains flying until end of turn. [–8]: You get an emblem with "Artifacts, creatures, enchantments, and lands you control have indestructible." [+1]: Untap two target lands. 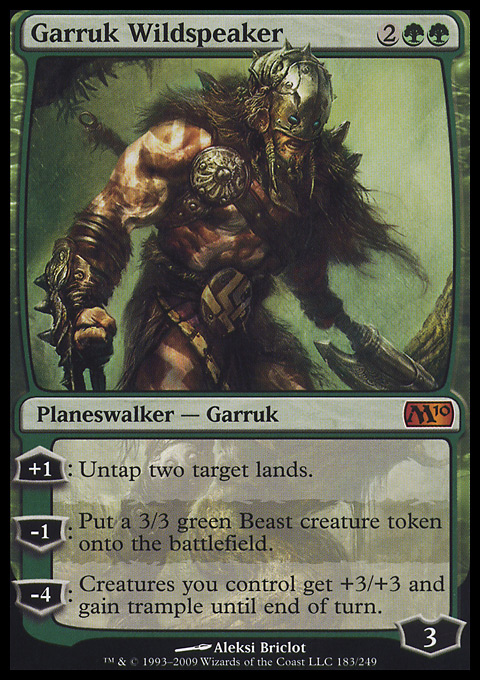 [–1]: Create a 3/3 green Beast creature token. [–4]: Creatures you control get +3/+3 and gain trample until end of turn. [+2]: Each player draws a card. 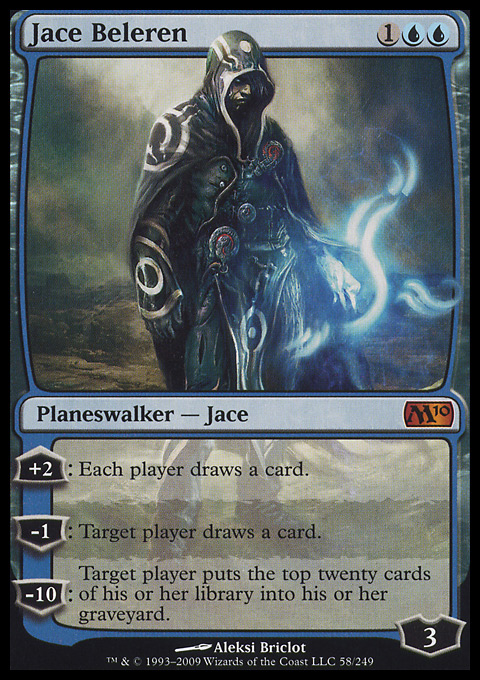 [–1]: Target player draws a card. [–10]: Target player puts the top twenty cards of their library into their graveyard. [+1]: Target player discards a card. [–2]: Search your library for a card, then shuffle your library and put that card on top of it. [–8]: Put all creature cards from all graveyards onto the battlefield under your control. [+3]: Destroy target noncreature permanent. [–2]: Gain control of target creature. 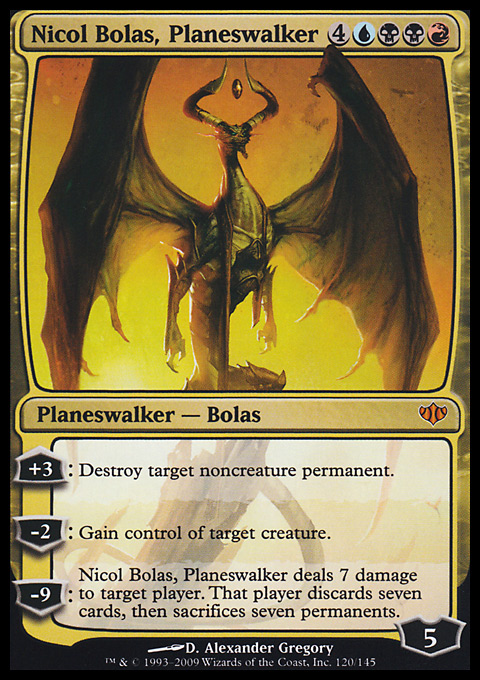 [–9]: Nicol Bolas, Planeswalker deals 7 damage to target player or planeswalker. 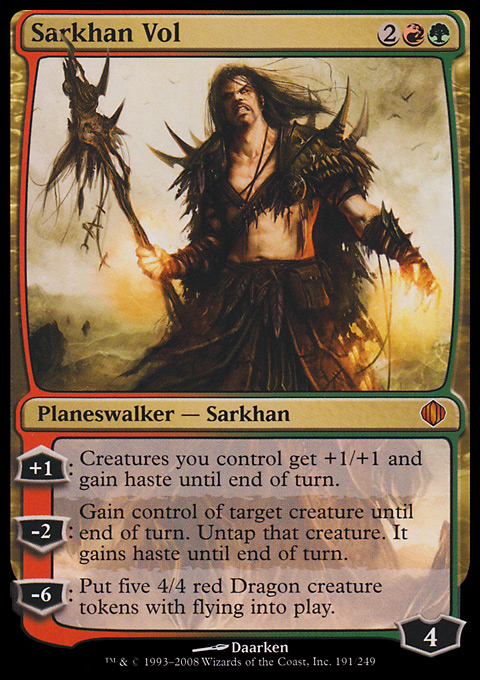 That player or that planeswalker's controller discards seven cards, then sacrifices seven permanents. [+1]: Creatures you control get +1/+1 and gain haste until end of turn. [–2]: Gain control of target creature until end of turn. Untap that creature. It gains haste until end of turn. [–6]: Create five 4/4 red Dragon creature tokens with flying. [+1]: Untap up to two target artifacts. 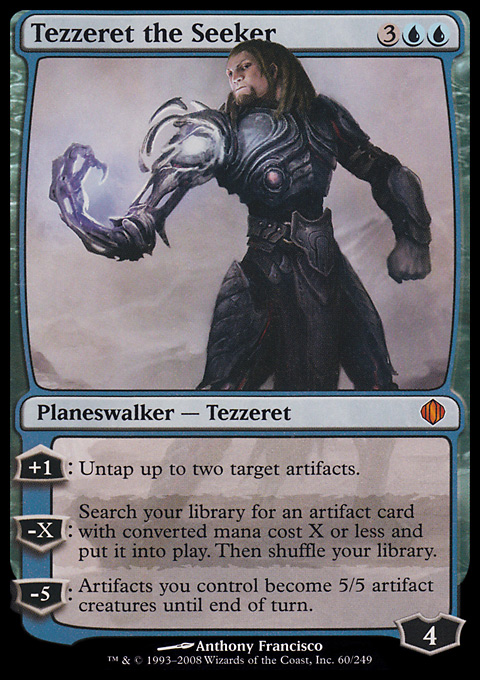 [–X]: Search your library for an artifact card with converted mana cost X or less and put it onto the battlefield. Then shuffle your library. [–5]: Artifacts you control become artifact creatures with base power and toughness 5/5 until end of turn.